Momofuku, by David Chang and Peter Meehan. Sometimes Asian flavors can be tricky at home. This book translates nicely into thehome kitchen. Recipes are simple and work, and the book gives a great glimpse into the workings of a young industrious chef. The Cooking of Southwest France, by Paula Wolfert. A reliable classic that is really a doctrine on the cooking of the southwest of France. Anyone who loves authentic, detailed, thoroughly researched recipes that you can settle in with for a day should have this timeless book. The Northern Heartland Kitchen, by Beth Dooley. This is the book that not only makes everyone tell you what an amazing cook you are, but also teaches you how to eat more local food, and why that is a good thing (and a fun thing!). Uncomplicated ingredients, clear cooking instructions and interesting sidebars about cooking in the heartland make this book a must for any cook. Baked: New Frontiers in Baking. by Matt Lewis. Quickly becoming my favorite turn-to book for sweets and desserts. Even for a new baker, the recipes are clear and easy to understand and complete, and include important steps for achieving a good end result. They don’t leave out important steps that make the end result not work and you don’t know why feeling. A great confidence builder for the home baker. Tartine, by Elisabeth Prueitt et. al. Another favorite baking book. Great pictures that inspire and good solid recipes. Chicken and Egg: A Memoir of Suburban Homesteading with 125 Recipes, by Janice Cole. Why this book isn’t on the bestseller list I don’t know. This book never fails to provide me with a recipe I can use right now that turns out every time and is delicious. Not only that, but I need to allow extra time for reading the copy about raising chickens in an urban setting. If you know someone who had their own chickens, someone who loves to cook or someone who just likes to read cookbooks this is my recommendation. Dersu the Trapper, by V.K. Arsen’ev and Malcolm Burr and The Tiger: A True Story of Vengeance and Survival, with by John Vaillant, my best read of the year COMBO. What a fun and amazing combination! Sea of Poppies, by Amitav Ghosh, A great and rollicking read! Lucia is co-author of Savoring the Seasons or the Northern Heartland with Beth Dooley, and Cooking Freshwater Fish. In 2004, 2005 and 2006 she was nominated for Best Midwest Chef by the James Beard Foundation, and in 2009 she was knighted by the French Government as a Chevalier du merit Agricole for her work in farming issues and food. 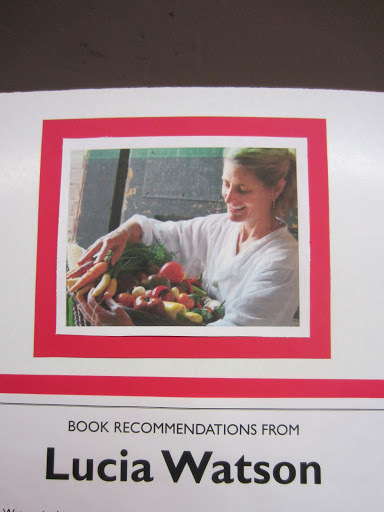 Lucia lectures and teaches nationally and locally, often in support of sustainable food. Stop by the store to check out her display and take a peak at these fabulous recommendations.